Pushing BPM to the cloud! Business Process as a Service (BPaaS), brings a new mode of process application to enterprise. After moving BPM to the cloud, the applications become very simple. Through simple operation, business person can assemble business process and system based on browser, and he doesn’t need to learn java or coding, or grasp the complex design of software architecture. Business person discovered soon, they can easily jump out the complicated technical environment, make communication with IT person smoothly, and even assemble simple processes to a complex and large business chain, which enterprise needs. Who Does aZaaS Solutions Suit For? 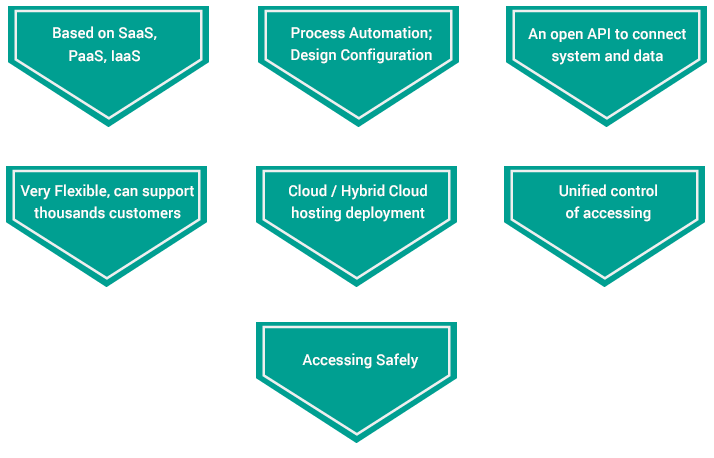 The BPaaS we provides based on entire open process platform (BPM), realizing: process automation+ system data integration+ application development+ enterprise mobility development+ “App Store mode” one-stop service, from horizon and vertical two aspects. Based on planning and organization，to build organization structure、position system and professional title system, which is consistent with enterprise development strategy, we provide standard and customized workflows for normalize the workflow of HR department. Using centralized procurement with process driven to optimize procurement price. To build a set of standard and effective supply chain, which includes models, such as source supplement, purchase evaluation, full authentication and so on. To save every penny from purchase, and make pre-tax profit directly. In financial management, the highlight is the issue of regulatory process, such as the control of four key link nodes including budget, cost, purchase, payment, and audit. This solution improve risking visibility, and avoid bad debts and wasting with the way of process. It involves process control since the signing of contract, to ensure the performance nodes including performance stage, legal and financial supervision, and remind operator to check and accept work in accordance with the terms. To maximize the protection of the profits for company and reduce the risk of compensation for breaking a contract. Mobile applications enables staff on the scene to handle claim request quickly. The biggest characteristic of financial industry is that the internal process of information management is very strict, and internal information flow of most enterprises need approval and follow the process within the enterprise, so we help customers to achieve cross-sector and cross-system process management, to overcome the problems traditional workflow encountered, thus to achieve strict access control, review, record within the organization, meet the requirements of internal auditing.